“A really useful tool for the group and has worked really well enabling everyone to engage in the singing and reminiscence. I found it very simple and logical to set up and use and it was very adaptable"
The Music Box is indeed simple to use and does not require any formal musical training to operate. It is therefore a considerable asset that can be used by any staff member, nursing or otherwise and at any time. It enables clients to gain from the many benefits that this group activity allows on a regular (daily) singing basis - a lot more often than is usually possible. It plugs into a television, or it can be operated through a projector & speakers. The bespoke piano accompaniment is designed to replicate singing round the piano in a pub or in the home. 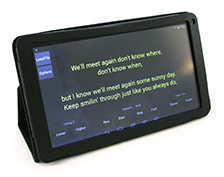 Unlike a Karaoke machine, which has a lot going on via the visual & musical backgrounds which can be confusing to many Dementia or elderly patients, the Music Box has been adapted to provide a simple colour background with only the words being displayed. Crucially, the key and speed can be changed to suit each individual patient group. It is also possible to show images on the screen which has been found to be very useful in the field of reminiscence. "As part of our programme of activities, the Silver Song Music Box helps our residents to live well with their Dementia. We have daily sessions and I have loads of fun with them...it's like electricity: the room comes alive - they start off sleepy and finish up alert, awake and engaged." This Big Lottery funded project started in October 2016 and runs for one year. We recruited ten Care Homes and they are all running regular singing sessions (at least one per week). We provided the Silver Song Music Box to ten Care Homes in Suffolk (listed below). The Music Box has been loaded with over 235 originally recorded versions of popular old songs. We trained activity co-ordinators, to run singing sessions for older people in the Care Homes, which makes the intervention totally sustainable. We provided a Performing Rights Society (PRS) licence and ongoing support for each group. We also offered a follow up service for groups needing additional help. Our project reached 320 older people including the Care Home staff and family and friends of the residents. Some of our Care Homes have special events, such as coffee mornings, to bring in people from the community to join in the singing. 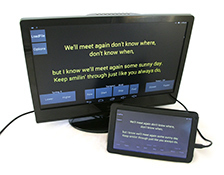 It is a wonderful thing to see carers able to connect with their loved ones through song, when normal communication has gone. We have had positive feedback from all the Care Homes in this project. "The Music Box is really turning out to be a wonderful experience for our residents. They are so enthusiastic, we have suggestions put forward of having small groups each singing a song, a special party where they could all put on their "Glad Rags". Somehow incorporating a pass the parcel game. I am having a real problem keeping up with them, it’s wonderful, a joy to behold." "We set up a Christmas choir with staff and residents and had a party with the Children's Centre next door. We have regular singing sessions with residents in our coffee shop. One resident who used to be very timid and stayed in her room, now comes and joins in the singing." "I would like to let you know of a fantastic spontaneous session I had on Wednesday with the residents and their families it started off with me and two residents just having a look at it then we all got singing and families heard and joined us and we ended up with about 15 people in total all singing and it was a magical moment for me as a coordinator I just took the lead and everyone followed! It makes my job a lot easier so thank you it’s already creating a stir within the home a positive one." This project was funded by Berkshire Community Foundation. It started in November 2016 and ran for 6 months. We recruited 2 Community Groups and 1 Care Home, and they are all running regular singing sessions.